It is probably difficult to follow Jose Rizal’s footsteps because he’s a national hero. Filipinos, especially students, are pressured to emulate Rizal because he had top marks at school (if you recall in the first chapter, Rizal was not the only student who graduated at Ateneo De Manila University with sobresaliente marks). But before he became a hero, he was a person. He was a human being just like the rest of us. He ate the same food like everybody else, he read the same books that anyone could’ve read, and he was also stingy just like some of us. In this chapter, Ambeth Ocampo shows that Rizal was no different from us. Based on Ocampo’s research, he discovered that Rizal usually had “hot chocolate, a cup of rice, and sardinas secas for breakfast” (61). 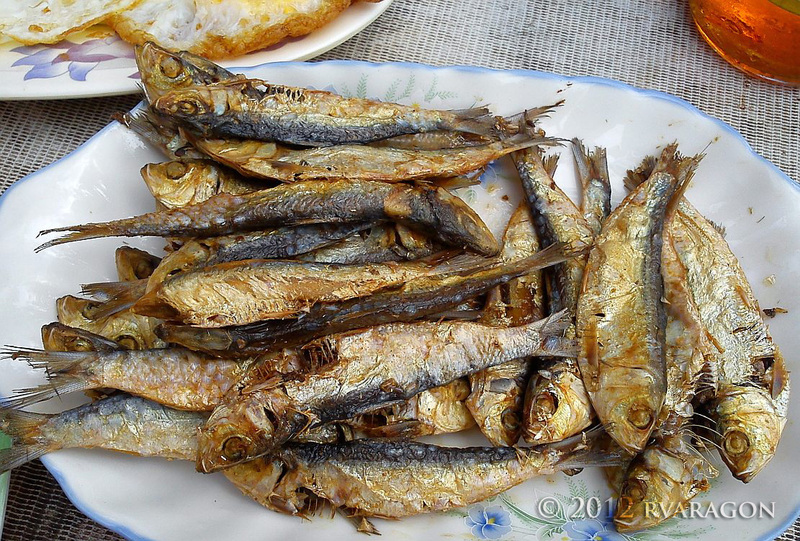 Sardinas secas is just another word for tuyo (salted, dry fish). For lunch, Rizal usually ate rice and ayungin (Silver Perch) (61). 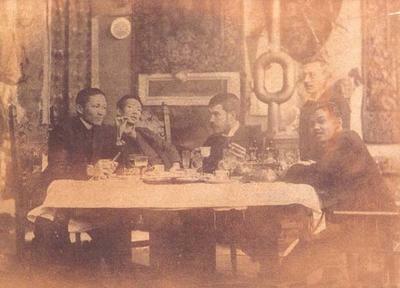 When the Rizal family lived in Hong Kong in 1892, the family had a 20-year-old cook named “Asing”. El Renacimiento Filipino published an interview between Vicente Sotto and the Chinese cook in June 15, 1913. In an interview with The Independent in 1929, Tinong mentioned that Rizal’s meals usually consisted of three dishes: a Filipino dish, a Spanish dish, and another Filipino or “mestizo dish”. Tinong also mentioned that Rizal liked lanzones and mangoes. It was rare to have a large library in the 19th century, but the Rizal family home had the biggest library in the town of Calamba, Laguna. Jose was raised “to appreciate and care for books”, so it is no wonder that his interest in books and reading started at home. Michel Levy’s Treatise on Public and Private Hygiene. 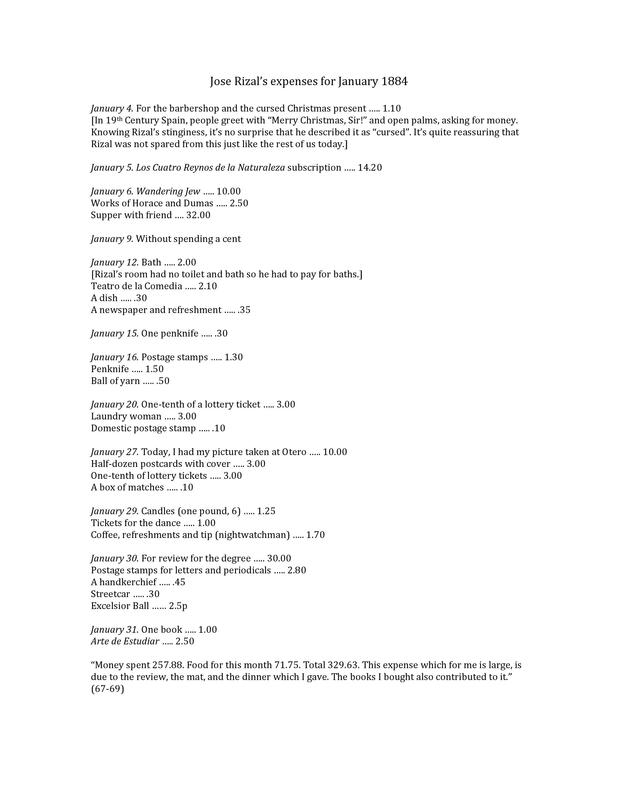 Below is a copy of Jose Rizal’s expenses in January 1884, when he was a student in Madrid, Spain. This list was one of Rizal’s lists that he wrote in his diaries and notebooks. Rizal eating tuyo, Rizal reading Hans Christian Andersen’s Fairy Tales, and Rizal listing his expenses provide proof that Jose Rizal was, indeed, just like the rest of us. This is Part 4 of a 9-Part Rizal series of Ambeth Ocampo’s Rizal Without the Overcoat. If Rizal stayed in Hong Kong and never returned to the Philippines in 1892, he wouldn’t have died on December 30, 1896. But he did. Ambeth Ocampo describes Jose Rizal as a “conscious hero” because Rizal planned his entire life in details based on his letters, diaries, and writings (9). In June 1892, Rizal wrote a letter that shows his love for his country and his fellow Filipinos. The step that I have taken, or am about to take, is undoubtedly very risky, and it is unnecessary to say that I have pondered on it a great deal. I know that everyone is opposed to it but I realize also that no one knows what goes on in my heart. I cannot live knowing that many are suffering unjust persecution because of me; I cannot live seeing my brothers [hermanos] and their large families persecuted like criminals. I prefer to face death and gladly give my life to free so many innocent persons from this unjust persecution. I know that, at present, the future of my country gravitates in part around me; that with my death, many would rejoice, and that, consequently, many are longing for my end. But what am I to do? I have duties of conscience toward my aged parents whose sighs pierce my heart; I know that I alone, even my death, can make them happy by returning them to their country and the tranquility of their home. My parents are all that I have, but my country has many sons still who can take it to advantage. Moreover, I wish to show those who deny us patriotism that we know how to die for our duty and for our convictions. What matters death if one dies for what one loves, for one’s country and for those whom he loves? If I know that I were the only pillar of Philippine politics and if I were convinced that my countrymen were going to make me use of my services, perhaps I would hesitate to take this step, but there are still others who can take my place, who can take my place to advantage. Furthermore, there are those who find me superfluous and in no need of my services, thus they reduce me to inaction. I have always loved my poor country and I am sure that I shall lover her until my last moment. Perhaps some people will be unjust to me; well, my future, my life, my joys, everything, I have sacrificed for love of her. Whatever fate my be, I shall die blessing my country and wishing her the dawn of her redemption. But let’s not forget; even though he loved the Philippines, he was only human. Even though he graduated with sobresaliente (excellent) marks in Ateneo De Manila University, eighth of his other classmates (out of the 12 students) graduated sobresaliente as well (14). Even though the Americans sponsored him as a national hero, Rizal thought the country didn’t have “real civil liberty” when he travelled in United States from April to May 1888 (17). 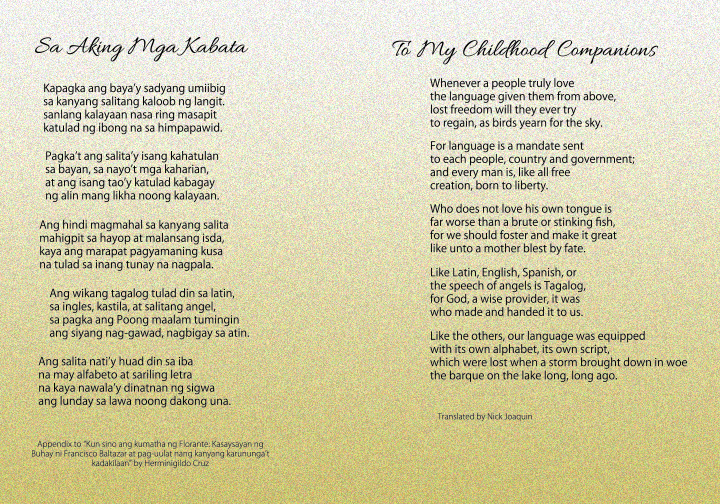 As smart as he was, there was no way that Rizal wrote the poem when he was eight years old. He was still a child. How would you describe Rizal? What are his other ‘identities’ that you’ve heard of? This is Part 1 of a 9-Part Rizal series of Ambeth Ocampo’s Rizal Without the Overcoat. I’m currently reading Rizal Without the Overcoat, a collection of essays and articles about Jose P. Rizal, the national hero of the Philippines. Rizal was also famous for writing Noli Me Tangere (1887) and El Filibusterismo (1891), the two novels that exposed the Spanish colonization and the Catholic Church in the Philippines. The anthology is written and compiled by Ambeth Ocampo. The articles are collected from his column, “Looking Back”, published bi-weekly in the Philippine Daily Inquirer. Ambeth Ocampo is a renowned public historian in the country focusing on the 19th Century Philippines and an associate professor at De La Salle University, Manila, Philippines. When I was a high school student, I read Rizals’ novels because it was part of the curriculum. Years later, I realized that I wanted to read them again–I wanted to know more about Rizal and why he was a hero. I wanted to know more than what I’ve learned in high school. That’s why I bought this book. And that’s why I’m writing about the book. I wouldn’t exactly call this series of posts a book review; rather, it’s a series of posts where I analyse each chapter in the book. I will summarize each chapter by taking out important points and highlighting historical facts that either validate or refute people’s opinion or knowledge about Rizal. I will quote Rizal and Ocampo to provide proof and to support my analysis. In short, this ‘Rizal’ series is like writing an academic paper but on a website. The anthology has 9 chapters–I’ll make it a personal goal to finish it before December 30th, to commemorate Rizal’s 118th death anniversary. History is a living and lively account of what we were and are; it could and should be as real to each of us as stories about family or about recent and past events, as anecdotes about people known and unknown, as fiction read in books. If all of that makes us understand humanity better, so does history make us understand ourselves and our country infinitely better, in the context of our culture and society.